And now, folks, it's time for Cooking with Krueger! The Nightmare on Elm Street Freddy Krueger Character Apron is a fantastic piece of horror-themed kitchen apparel that fans of the Nightmare on Elm Street films will definitely want. 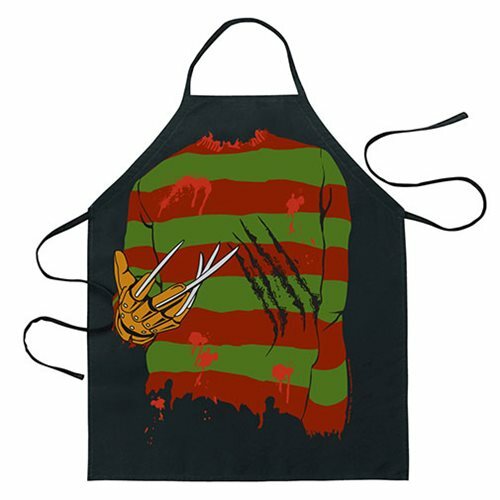 With Freddy's classic worn, weathered, and bloody striped sweater, along with his intimidating claw glove, you'll never want to cook with another apron that's more tame. All you can hope for now is that Freddy doesn't turn your cooking dreams into horrible kitchen nightmares! One size fits all adults. Ages 17 and up.